Manufactured from tough water resistant leather, keeping the users feet nice and dry. The non metallic composite perforated safety toe cap provides exceptional toe protection for the user. Designed with a metal free pierce resistant midsole that protects the user from all under foot dangers . The outer sole consists of nitrile based rubber that is heat resistant to 300°C. Conforms to EN20345 Safety Standard. Using Lorica leather and the New Safety Dry technology, this boot is both breathable and water resistant. The lining is comprised of WingTex air tunnel textile lining material. The toe is composite, perforated with breathable membrane. The pierce-resistant non-metallic midsole is in soft P.U. for extra comfort. U-Power Enough S3 Safety Boot conforms to: EN ISO 20345 : 2011 S3 SRC. 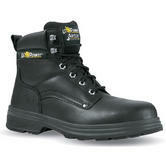 U-Power Mustang Black Safety Shoes are an excellent steel toe boot that combines strength and safety. Made from tough leather these shoes are made to last the most demanding of situations. They are an excellent all round safety shoe, that will give the wearer long lasting protection. These boots offer superb grip. Grey-Black trainer style safety shoe from SK Grip range with dual density PU anti-slip sole (polyurethane). U-Power Demon Grip men safety trainers combine look, technology and comfort. A safety shoe designed to meet the taste of the new generation of professionals. Soft grey suede leather with highly breathable mesh textile upper. AirToe Aluminium perforated lightweight toe cap with breathable membrane. Save & Flex Plus non-metallic pierce-resistant midsole PS4 MATRIX. Action Dry anatomic, breathable footbed, in EVA support with textile material. U-Power Demon Grip S1P SRC Safety Trainer conforms to: EN20345 S1-P SRC standards. The U-Power Nero safety trainer has a super grippy out-sole and a water repellent upper. This safety trainer is antistatic, and has a comfort foot-bed. It’s made from top quality materials that give the wearer long lasting protection whatever the weather. These trainers comply with the highest of safety standards. U-Power Nero Grip S3 SRC Safety Trainer conforms to: EN20345 S3 SRC safety footwear standards. Safety shoes with water-repellent soft and durable kangaroo leather upper. Extremely soft and abrasion resistant kangaroo leather upper. Padded collar for more comfortable and firm fit. Penetration resistant composite midsole plate tested to 1,100 Newton. Poly soft, Anatomic insole made from soft polyurethane, with open pockets in the area of the foot support. U-Power Testimonial Safety Trainer Shoes conform to: EN ISO 20345:2011 S3 SRC safety footwear standards. Available in size UK 4 - EU 37 only. Skateboard style safety shoes, lightweight and comfortable suitable for indoor activities. Water resistant soft nubuck leather upper. AirToe Aluminium perforated safety toe cap tested to 200 joules impact with breathable membrane. Anatomic insole made from soft polyurethane, with open pockets in the area of the foot support. U-Power SN20014 King Men Safety Trainer Shoes conforms to: EN 20345 S3 SRC safety footwear standards. Available in size UK 11 - EU 46 only. Extremely soft and abrasive resistant kangaroo leather Upper. WingTex air tunnel textile materiall lining. Sole - Soft PU Softener, U-GRIP® Last Generation Tecnopolymer. Antislip, antistatic and hard wearing P.U. Outer Sole. U-Power Savage Grip UK10164 Safety Boot conforms to EN20345 S3 SRC safety standards. We love U-Power safety shoes: they are light, neat, smart. U-Power combines Italian design with advanced robotics to make a range of advanced, comfortable safety boots at a good price. They use clever technologies such as the U-Grip rubber compound and tread - to improve sole grip. The use of perforated composite toe caps means that these safety boots are lighter, and breathe ? better for your foot and handier for airports. When you wear U-Power safety shoes or boots you enjoy all these qualities - in addition to a guarantee of durability and an exclusive Italian design: it?s also nice to look good! Try the classic U-Power Track safety boots. These are ultra-light and ventilated, metal-free toe cap. Discover the U-power Taiga safety rigger boots (a rigger boot like no other, with super soft synth wool lining for comfort). Take a look at the U-Power Demon Grip: a light, breathable safety trainer that you?ll want to wear even after work - for its style and comfort. Finally, the U-Power Enough safety boot - for when you have a had aneough of germs being carried from one area to the next or when you need an easy wipe upper - so that you can wipe off grease and splashes easily from your boot. The Enough is made of Lorica leatherette - which wipes clean easily.